Have you ever had an itch you just can’t reach? 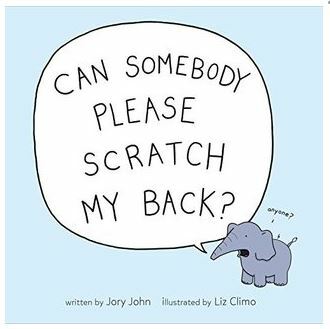 Then you will appreciate elephant’s predicament in this book. However, page after page, elephant is unsuccessful in finding help. Elephant seeks the help of many animals: turtle, crocodile, hippo, sloth, and they are all adorable, very colorful against the white page backdrop. However, as cute as they are, they are not too helpful. In the end elephant does find a solution using a porcupine. Elephant’s appreciation, or lack of, leaves porcupine in the same predicament. Verdict: for the right audience this book can be funny. While not a good example of helping others and kindness, it can be used as teaching moment as to what could be done differently. August 2018 review by Denyse Marsh.